Our current knowledge of ethnographic cinema is in constant evolution as films emerge in national collections that were previously unknown to historians of documentaries about indigenous populations. Such is the case with the Belgian native Marquis de Wavrin, who, while famous during his lifetime, increasingly faded into obscurity after WWII, up until his death in 1971. With the rediscovery of 45 boxes of film housed in the Royal Film Archive of Belgium, this situation has now begun to change through the DVD publication entitled MARQUIS DE WAVRIN. This digital edition contains most all of the films he made, as well as a documentary (MARQUIS DE WAVRIN -- DU MANOIR À LA JUNGLE / FROM THE MANOR TO THE JUNGLE, 2017), about his life, his cinematic output, and the process of restoring his films to their rightful place in the context of ethnographic film history. During the 1920s and 1930s, he was known as Belgium’s greatest explorer, as well as a talented writer, photographer, and filmmaker. At a time when numerous Belgians embarked to other continents to exploit colonialism as industrialists, business executives, or merchants, the Marquis de Wavrin headed to South America. The life he led reflected a tension between two callings: that of adventure, and that of curiosity and interest in the humanities of others. He was on the one hand proud of his hunting feats in the jungle and on the other of his friendships with the Indians. This duality may be found in his many books and films, comprising accounts of his adventures, as well as meticulous and methodical recordings of the habits and customs of the indigenous peoples. The Marquis de Wavrin was one of the very first explorers to have used (from 1919 onwards), a 35mm camera as a notebook to record the habits and customs of the indigenous inhabitants of South America. As such, he became known as one of the pioneers of visual anthropology. The Marquis de Wavrin organized several trips to South America over a period of two decades. His interest in the peoples of the Amazonian forest was awakened with his first film, AU CENTRE DE L’AMERIQUE DU SUD INCONNUE (AT THE HEART OF UNKNOWN SOUTH AMERICA, 1924), which in this DVD edition was reconstructed from unedited rushes preserved at the Royal Film Archive of Belgium. With AU PAYS DU SCALP (IN THE SCALP COUNTRY), filmed from 1928 to 1930 in Peru, Ecuador, Columbia, and Brazil, and distributed in Europe and South America, he gained international recognition. He journeyed back to Columbia for CHEZ LES INDIENS SORCIERS (AMONG THE INDIAN SORCERERS, 1934), and just as with his previous films, he lived with several Amazonian tribes for many months, studying their mores and customs. 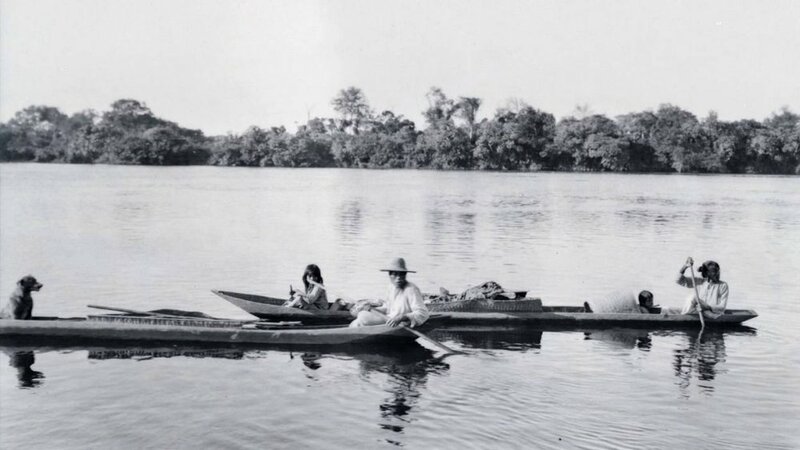 In his last film, VENEZUELA, PETITE VENISE (VENEZUELA, LITTLE VENICE, 1937), he fell short in his journey to discover the source of the Orinoco River. Bonus material includes censored scenes from AMONG THE INDIAN SORCERERS as well as an interview with a collector of shrunken heads that were brought back by the Marquis de Wavrin from his South American journeys. A fascinating and intriguing person, he left us some extraordinary images of the South American continent. For the latest announcement about our releases please see GME's Fall 2018 DVD Release.